Not far from the intersection of Broadway and Queens Boulevard in Elmhurst, tucked away amid a cache of Southeast Asian restaurants and snackeries, lies this gem of an Indonesian boutique. Unlike some nearby markets which tend to be either Thai-centric or comprehensively Southeast Asian, Indo Java concentrates on the delicacies of Indonesia. 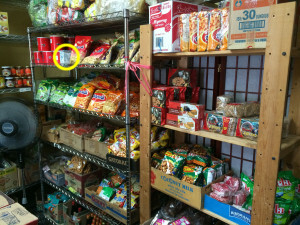 The perimeter of the shop displays a wealth of products: packages of blended spice mix, dozens of snacks including an abundance of emping, cake and dessert mixes, a myriad of bottled sambals and sauces, and a small frozen food case. 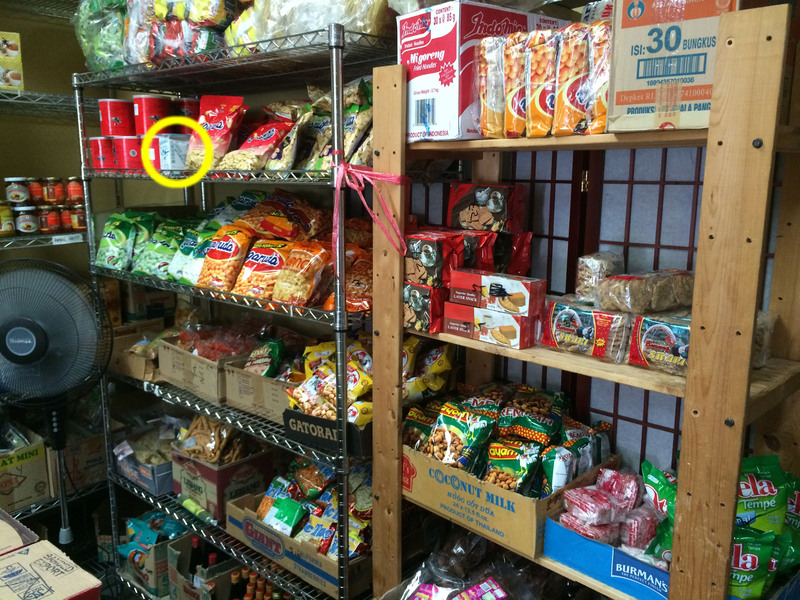 Attempting to focus on any individual item can be a little daunting at first, particularly because the venue is tiny and it’s easy to gloss over the hundreds of products competing for your attention. 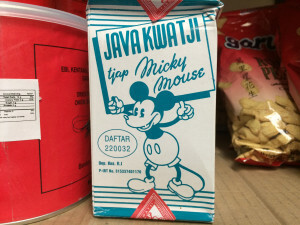 It’s worth taking a bit of time to zoom in, however: this Mickey Mouse brand of dried salted watermelon seeds is a good example. 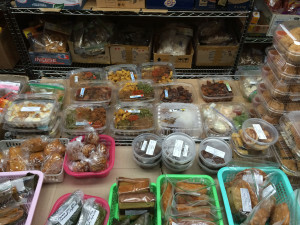 But the most compelling feature of the store and one that begs a repeat visit, is the array of tempting prepared food that’s replenished every Saturday after 6pm. 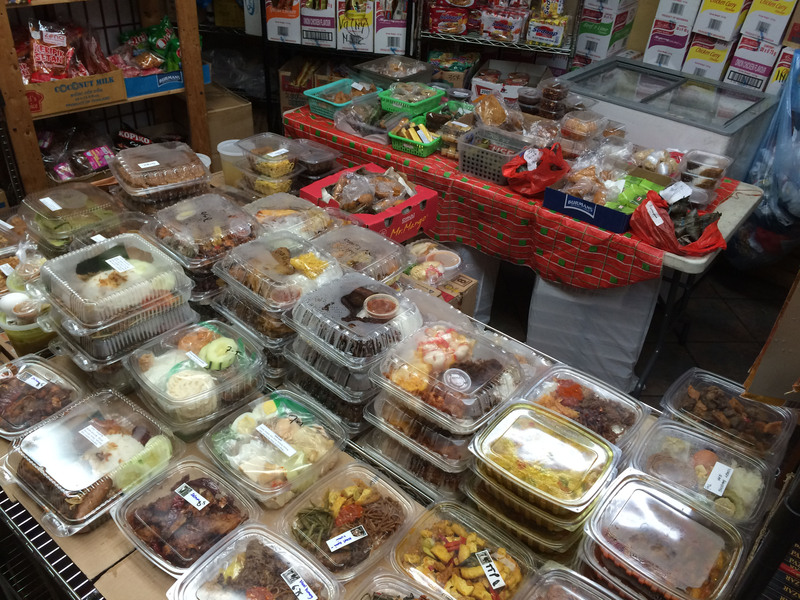 An overwhelming variety of Indonesian snacks, main dishes, and sweets grace a table toward the back of the shop. Elvi, the co-owner, will be more than happy to answer your questions and, if you’ve worked up an appetite while shopping and can’t wait to get home with your goodies, can point you in the direction of their sister restaurant, Java Village, nearby at 86-10 Justice Avenue – although my experience was that the store had a much wider variety of offerings than the restaurant. 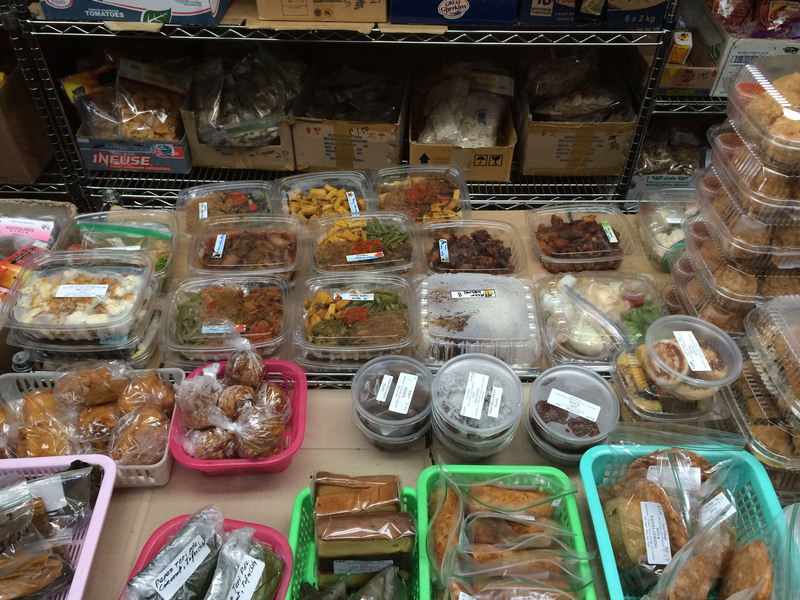 Here are a few of the items that came home with me after my last visit. 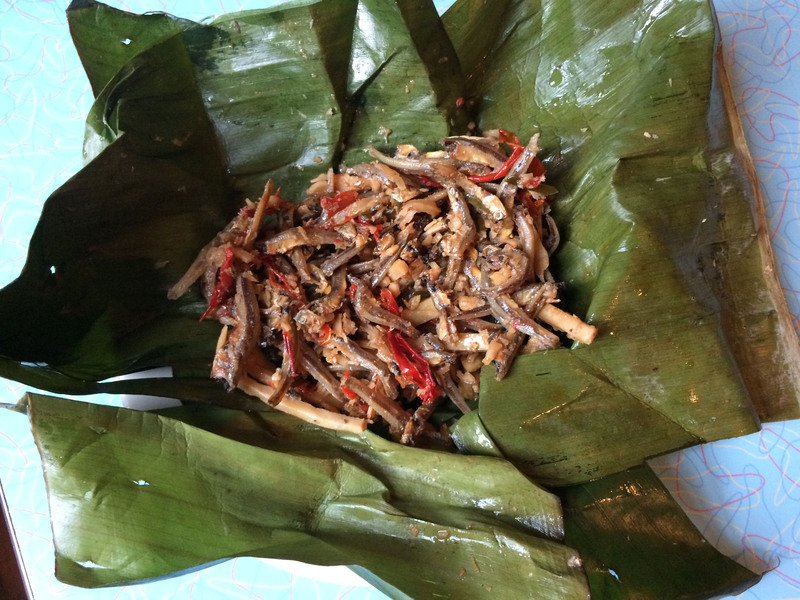 Pepes refers to food, often involving fish, that has been prepared by wrapping it in a banana leaf and then steaming it (although it’s sometimes grilled); this pepes teri (anchovy) is a little sweet, a little spicy and also contains tofu, coconut, chilies, and galangal. Delicious. 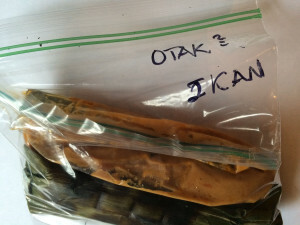 Otak otak ikan is sort of a leaf-wrapped fish paste (ikan = fish), but these tasty tidbits don’t really betray much fish flavor – only a slightly sweet, slightly oniony, slightly chewy snack accompanied by peanut sauce and it’s near impossible to consume just one. Incidentally, the repetition of a word as part of a grammatical construct is common in Indonesian and Malay, and in linguistics is referred to as reduplication (a word which itself seems redundant); cumi cumi (squid) and gado gado (a vegetable salad) come to mind. Often, as in this instance, appending a “2” to the word is used as shorthand. 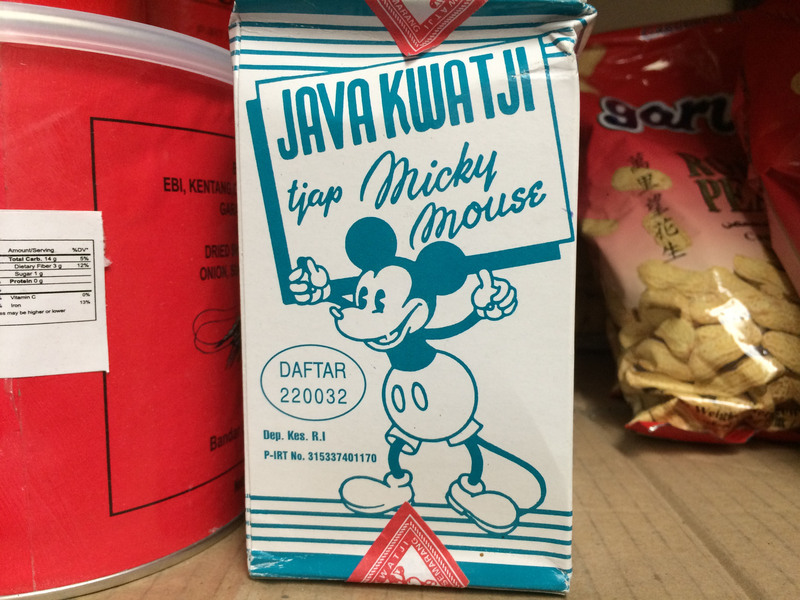 Yum2. This much larger arem arem was quite tasty as well. 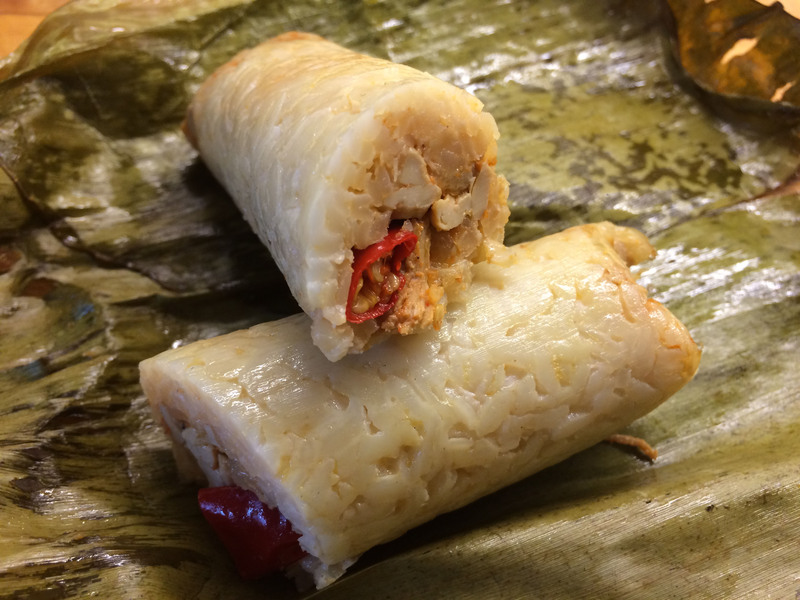 Along with coconut milk, the leaf flavors the rice that’s wrapped around bits of tofu and shredded chicken – but beware the hot red chili lurking within! 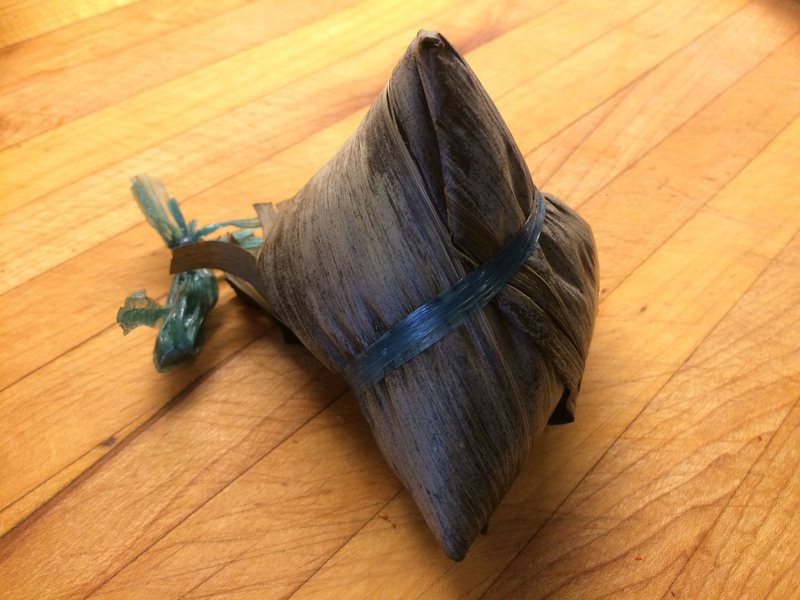 Bakcang beras – You’ve probably seen this pyramid of bamboo leaf-wrapped, glutinous rice (beras = rice) in Chinatown where it’s known as zongzi and filled with an assortment of savory tids and bits. 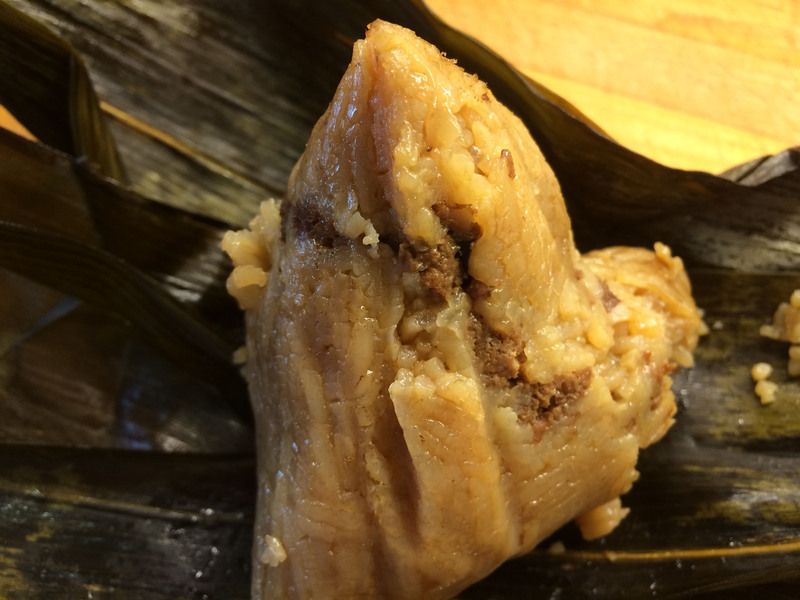 In addition to pork, this one contained mushroom and preserved egg yolk. (After steaming it, I decimated the pyramid so you could see its inner workings.) 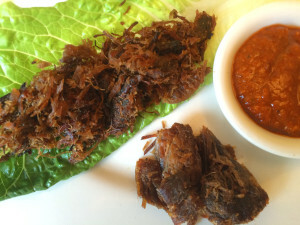 Served with a sambal. 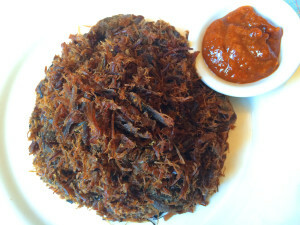 Empal – Sweet and spicy shredded beef. Typically the meat is boiled first along with aromatics and spices, then cut into lumps and pummeled just enough to loosen the fibers, then often fried. This version has taken its lumps and been beaten beyond recognition into shreds although there are a couple of chunks in there so you can get the idea. I found it perfect with rice or in a lettuce leaf wrapper with sambal oelek. Ikan salmon asem manis – sweet tamarind salmon (asam = sour, manis = sweet, asem manis refers to tamarind). 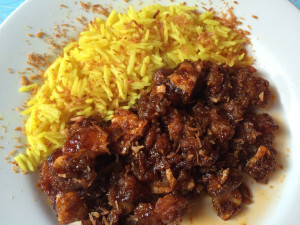 These fried bits are off the charts delicious, especially with the nasi kuning (rice with coconut milk and turmeric) that I made as an accompaniment. 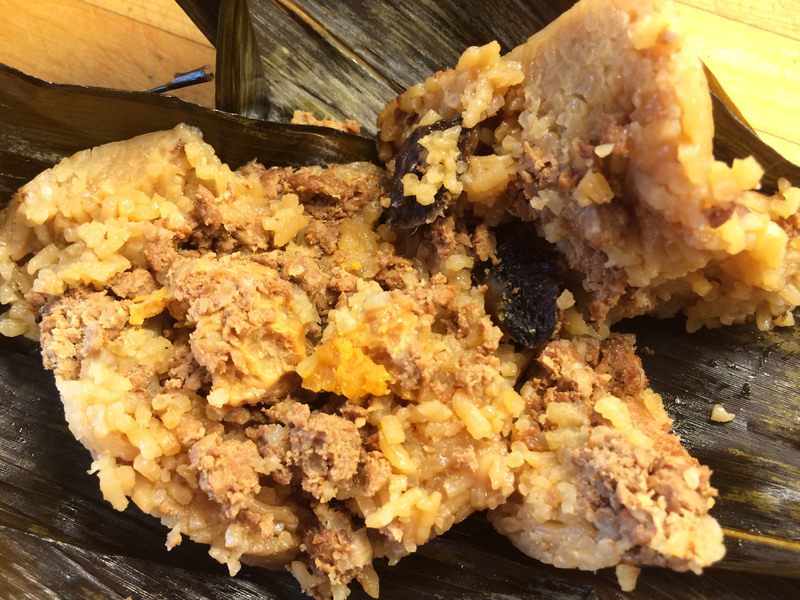 Yes, it’s oily, but so good. 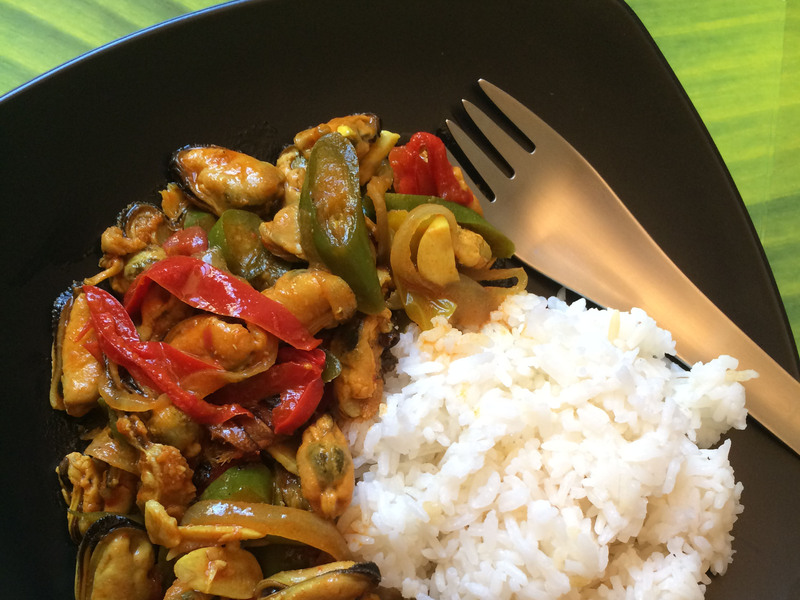 Kerang – The word can refer to clams, scallops, mussels, or pretty much any bivalve. This dish of green mussels is very spicy and very good, here served with plain white rice. 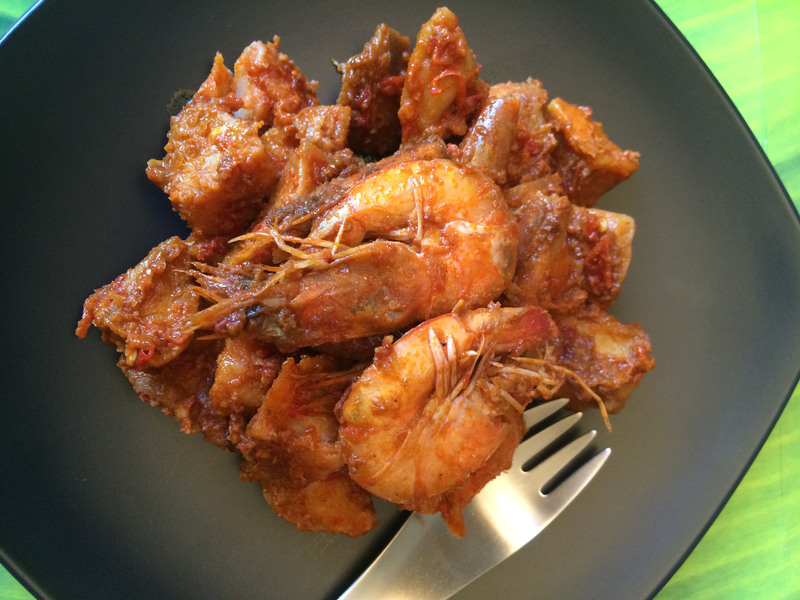 Udang Balado – Udang means shrimp and balado refers to the method of preparation: a tomato based sauce with lots of chilies and in this case potatoes. This rendition had more shrimp heads than shrimp which provided a tremendous amount of flavor and yes, can be eaten. I’ve also seen this dish prepared with stink bean (aka sataw, petai, peteh, bitter bean, and smelly bean, a vegetable common in Southeast Asia and nowhere near as nasty as it sounds). 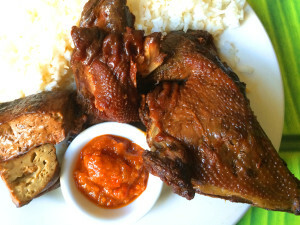 Ayam kaki – chicken leg. I didn’t get the ingredients or even much of an explanation, but it tastes like it’s been marinated forever in sweet Indonesian soy sauce with perhaps some garlic and ginger and then probably barbecued. The tofu (tahu bacem or tempeh bacem to the left of the sambal) that came with it was amazing (probably marinated in the same stuff). The sauce only looked like sambal oelek but wasn’t as fiery and had a chickeny component. Time for dessert! Martabak manis: “pandan special mix” was good, but unusual. 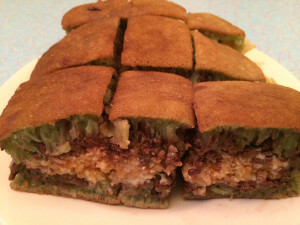 Murtabak (with a “u”) is a pancake wrapped around a variety of savory fillings usually including meat and egg that’s found in Malaysia and throughout the region. 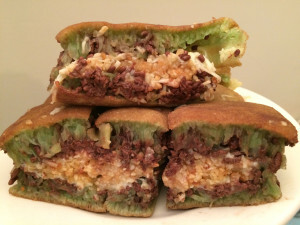 Martabak (with an “a” and found only in Indonesia) can be either the savory snack or a sweet one like this. It’s completely unlike its savory cousin: even the pancake is of a radically different texture – more like a crumpet. 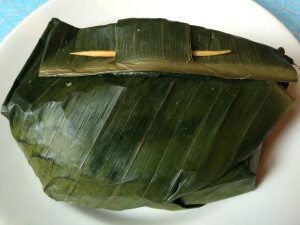 This one was flavored with pandan and the layers encased chocolate, peanuts, grated fresh cheese, and sweetened condensed milk. 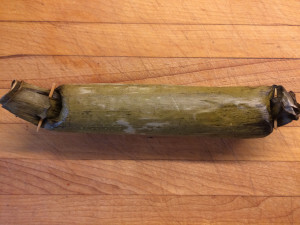 I warmed it up a bit and served it with coconut ice cream, which was the icing on the…well, you know. 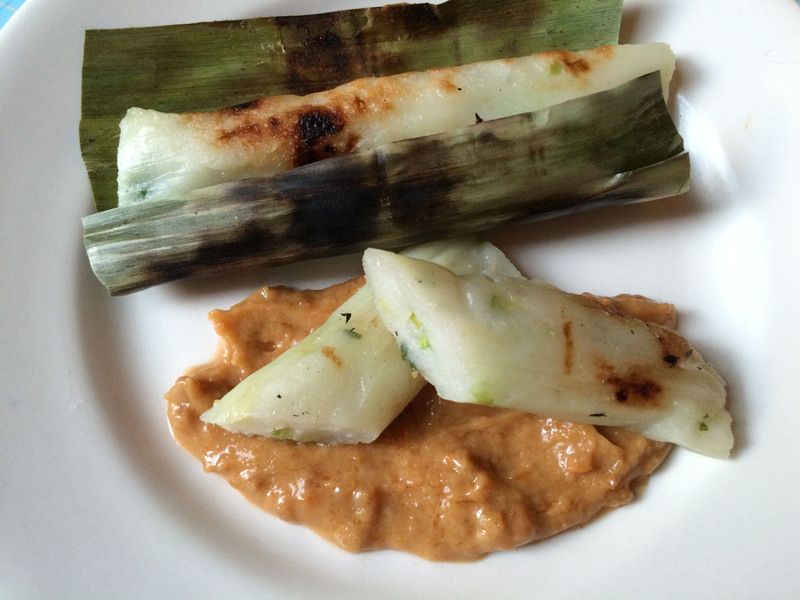 This entry was posted in Good Eats, Shopping, Stories and tagged Indonesian by Rich. Bookmark the permalink.